If you haven’t been following our drivers license saga, I’ll give a quick synopsis. More than two years ago we began the process to convert our valid German issued EU drivers licenses to Italian ones [We had gotten these when we lived in Germany 25 years ago. They don’t expire]. It is mandatory that you get an Italian License to live here. You can drive on a US license for only one year from your date of residency. Some people, erroneously, think a US issued international drivers permit will suffice. It will not. If you don’t get an Italian license you risk major fines, impoundment of your car and your insurance will be void if you’re in an accident. There is no reciprocity between the US states and Italy, so you have to take the tests, which are notoriously difficult. So, to avoid this test, we enlisted the help of an Auto services firm in the next town, after first being turned down by ACI, the equivalent of the AAA here. The issue was that our names and places of birth differed slightly on our documents and they didn’t want to deal with it. This new agency, though, was very helpful and willing to work through every obstacle, and there were many. The lovely woman there, is named Sandra and we went back again and again, during the last two years, each time bringing new forms, trying to comply with the requests. We even had to go to Rome to get the Embassy to endorse our attestations. Finally, last fall they asked for proof we had taken the driving test in Germany. We could not get this. I was loathe to give up but finally realized we’d hit a brick wall. I put it out of my mind and decided to drive on the VALID German one. I thought I could explain I’d tried to convert but it was not possible and since it is a EU license and still valid I figured I had a fighting chance with the cops. Luther, on the other hand, had decided to try to do the test. He was studying and was taking on-line sample tests. And, by the way, I don’t have hair that short anymore. That tells you how long it’s been since we started! This entry was posted in Drivers License, everyday life in Umbria, italian paperwork, Legal stuff, Umbria on January 18, 2019 by Nancy Hampton. 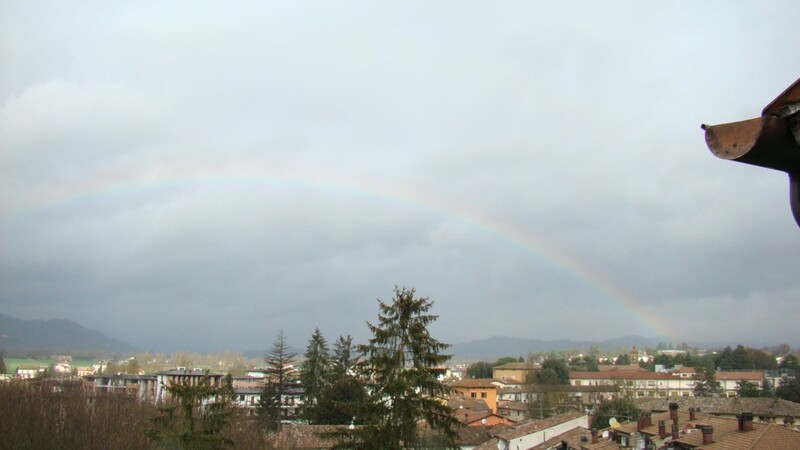 This entry was posted in everyday life in Umbria, italian paperwork, Legal stuff, Permesso di Soggiorno on December 15, 2018 by Nancy Hampton. When we last checked in on the drivers license issue we had returned from Rome with our Attestizione affirming we were us, even though our documents didn’t exactly match. Errand to Rome. Our next visit was to the Comune where we had the very helpful lady in the Records office affix our photos to a paper which stated we were, indeed, us! Who knew they’d have a form all ready to do this? Strano! We took these new documents back to the nice lady who’s helping with all this and she looked very pleased. She had to go, with this enormous pile of accumulated documents, to the equivalent of the DMV in Perugia. She called them pazzo, which means crazy. We had read the reviews on the web for this place and I’ve never seen such! Like the third circle of hell. She told us she’d call after her visit. Which she did and had good news! We were to come in and see her doctor for a cursory exam and we should be good to go. We returned to her office and went in to see the doctor who asked me to read maybe four letters from an eye chart and 25€ later (each) we had his certificate of approval. What a scam. She told us to come back the following Friday. Oh and we had to pay 300€ to her, the first she’d asked for, for her services rendered. This was quite a bit but she had paid for our stamps and fees so I think it was worth it. Yesterday was the big day! We hoped to actually pick up our licenses… well, we sort of did. We went back and she gave our German licenses back and a sheet of paper for each saying we had applied for the conversion. She said, depending on which bureaucracy got the job we would have the plastic card in a month or two, or four…who knows? Anyway, we are done except to wait for her call that they have arrived. I am SO glad this is done! This entry was posted in Drivers License, italian paperwork, Legal stuff, Umbertide on May 20, 2017 by Nancy Hampton. I have not written about the ins and outs of obtaining an Italian Driver’s License. Our situation is a bit different from most Americans because back in the 1990s we lived in Germany and, at the time, we could obtain a German license easily and still retain our US ones. These licenses never expire(!). All EU countries and many non-EU countries have agreements where you can exchange a license for one in another country with reciprocity. We are trying to take advantage of this by exchanging our German licenses for Italian ones. The United States does not have reciprocity with Italy. The main issue is that America does not have a country driver’s license. Each state issues their own license. When we move from state to state in the US sometimes we even have to take the test to get a new one depending on the rules of each state. So this means Americans can drive legally in Italy using their US license for one year after they become residents after which time they need to take the tests for an Italian license. Many Americans are under the impression that they can obtain an international license from AAA and drive legally on that, renewing it yearly. This is not true. You can drive on one of these for only one year before having to take the tests. The penalties are onerous if you don’t get an Italian license after a year. Fines and worse than that, your auto insurance will not cover you in the event of an accident. I can’t speak from experience since I have not taken the test but I do know what it entails. There are two parts; written and practical. You can study for the written test and take it on your own. Once passed then you will need to enroll in an auto scuola to take the practical part. You cannot take this on your own due to a recent law requiring you to enroll in a school. It is a real scam because it costs at least 500€. The written test is all in Italian and extremely technical. There are ways to study for it online or you can go to the school for this too. Here is a first hand account of an American going through the process. It is long but very informative. Once you are finally able to get your license there are restrictions for the first three years of driving (even though you may have been driving for 40 years!). You may not drive faster than 100 KPH On toll roads and no more than 90 KPH on non-toll roads. For the first three years there is Zero alcohol allowed. And for the first year a limitation on the size of the engine or horsepower of the car you can drive. This entry was posted in Drivers License, italian paperwork, Legal stuff on April 17, 2017 by Nancy Hampton. This past week we took a day trip to Rome. We are STILL trying to get our German drivers licenses converted to Italian ones. We started this process last year and hit a road block. Italians like every document to match perfectly. In our case our Italian documents say we were born in a city in the US, while our German licenses list our state. Even though we brought in our birth certificates which list both they said no. And we’ve learned two main things here. One, when a bureaucrat makes up his or her mind you have no recourse. And two, they each make up the rules as they go along. We gave up until it occurred to us that we could just try another place and hope for better luck. So we went to the next town called Trestina. And we visited the little auto services place there. A nice woman is helping us and we took in all of our copies of all of our documents. We waited and she called and we returned. This time the discrepancy was not only our places of birth but Luther’s name. On his Italian documents he is Luther Pearson Hampton III. On the German drivers license he is merely Luther Pearson Hampton. Oh no! So, she explained we had to do an attestazione to swear we were who we said we were even though we were born in different places and had different names. And we had to do this in Rome at the American Embassy. So we created our attestazione and took the train to Rome. It was a pretty day. It takes about two hours to get to Rome on the train. Then we walked the maybe ten minute walk to the Embassy. They were super nice there. Nothing like the Florence Consulate. We went through the security and the man took our papers and said they get this all the time. We paid $50.00 for each notarization. Cash cow for the Embassy! Another guy stamped and witnessed our signatures. Mission accomplished. We were back home by 6pm. Next steps, we have to get four photos made. And we have to affix one to a piece of paper stating who we are and our address. Then we have to go to the Comune and get them to attest that we are who we say and that we live at that address. First we have to find that office since all the people from the Comune are scattered around town due to the renovation. I sure hope we can get the licenses after all this! This entry was posted in Drivers License, everyday life in Umbria, italian paperwork, Legal stuff, Umbertide, Umbria, Uncategorized on April 14, 2017 by Nancy Hampton. It’s a banner day for us! Luther took his A2 Italian proficiency test week before last and got notification a week later that he had passed! This is our (we hope) last hurdle to comply with our immigration agreement. RE: Outcome of the Immigration Agreement assessment: Certified fulfillment. The next page indicates we have achieved 34 points on the point system they use here. We needed 30. I’m letting out a big breath of relief. A 2+ year effort! And we didn’t have to take the dreaded Italian Civics class! This entry was posted in everyday life in Umbria, italian paperwork, Legal stuff, Uncategorized on December 12, 2016 by Nancy Hampton. 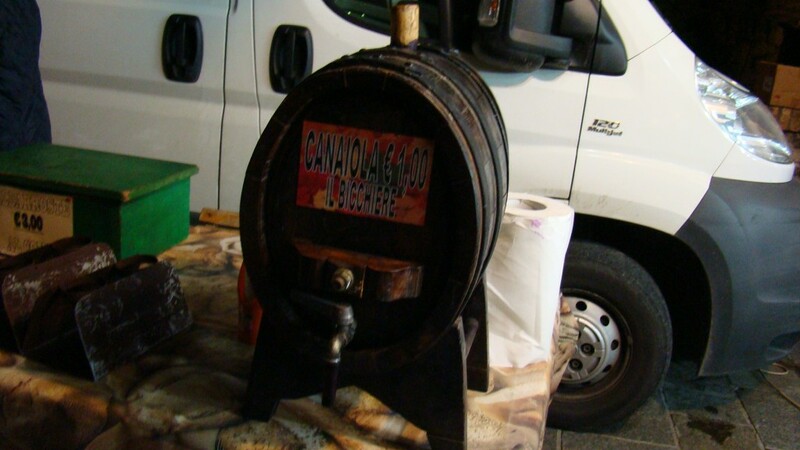 Today, for the first time that I know of, Umbertide is celebrating the Festa di San Martino. 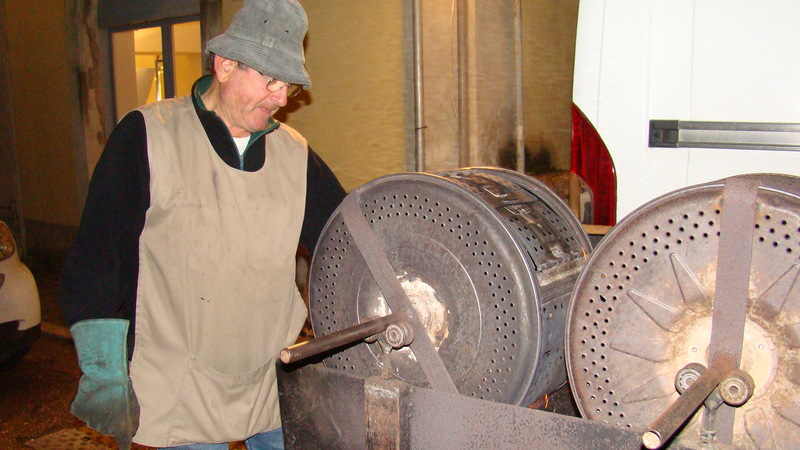 It is celebrated with roasted chestnuts, new wine, sweets, prosciutto, and bruschetta. Lovely and one of my favorites. I took a couple of pictures, bought some chestnuts (which I love), and we engaged in the passagiata on the chilly evening. Yesterday was a good day. We got lots accomplished. First and foremost was the everlasting issue of our immigration agreement. If you’ve been reading, it is recurring theme. As you may remember, we signed an agreement when we got our first Permessi di Sigorno to fulfill certain criteria. Well, since we had not fulfilled these, not because we hadn’t tried mind you, we got a letter in the mail telling us our two year period was over and we were on probation for another year after which we’d be deported. So, we decided to pay a visit to the immigration office in Perugia. We finally managed to find a person who knew what was what and could help us. Wow! Very friendly, nice, and helpful. We had, of course, pretty much complied. All we need to do is bring our proof of passing the A2 level Italian proficiency test, our deed that we purchased our house, our health cards showing we have gotten health insurance. They said that would be sufficient. Yay! Happy days. 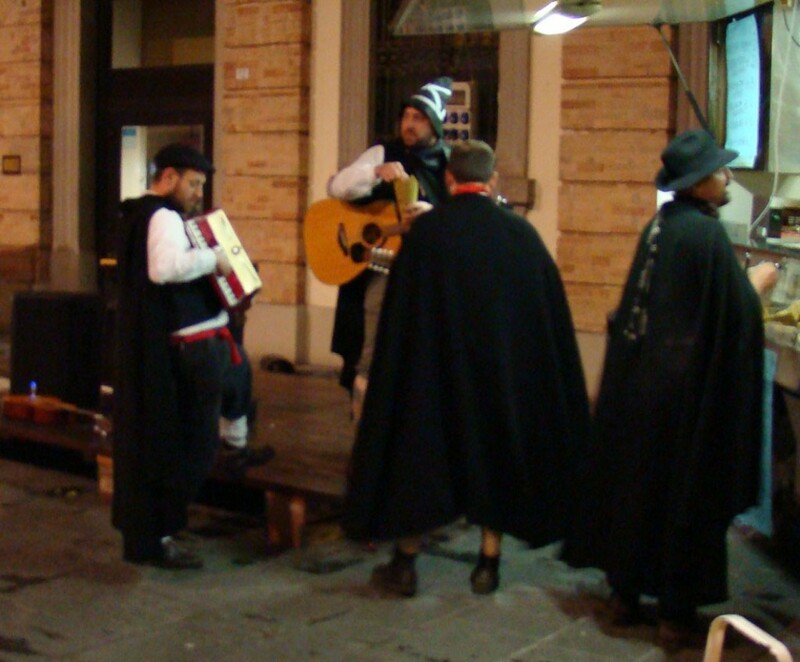 This entry was posted in everyday life in Umbria, Festivals and Sagras, Legal stuff, Umbertide on November 13, 2016 by Nancy Hampton. I just put up a page, accessible from the top navigation, with a summary of information about moving and living in Italy. It is called “So you’ve decided to move to Italy”. I will constantly update it with things I learn that I think will be useful. Go to the page here. This entry was posted in Cars, everyday life in Umbria, geometra, House Hunting, House renovation, house renovations, Italian Lessons, italian paperwork, Italian Visas, Legal stuff, Moving Cats to Italy, overseas move, Permesso di Soggiorno, Real Estate, Umbertide, Umbria, Uncategorized on October 1, 2016 by Nancy Hampton. We have finally gotten to summer after a long, cool, wet spring. Events are planned in the Piazza. The old men play briscola all afternoon at the tables at Bar Mary. Evenings lately are boistrous affairs with the European Soccer championship going on. Lots of cheering from the Piazza as people crowd around the TV provided by Mary and Irene. We have recently said goodbye to Luther’s brother Jeff and family who were visiting Italy for the first time and managed to find a few days to visit us here. It was nice to catch up and get to know his children Aaron and Allie. We visited Perugia, had a great dinner in Montone and they all took a cooking class at Agriturismo Calagrana. It was pouring rain that day! We made a trip to Gubbio where a talented artisan makes beautiful reproductions of Byzantine and Roman friezes etc. I had wanted to buy one for a long time. Here is the one I chose. As for bureaucratic things, we applied WAY back in January to renew our Permessi to stay and we finally got our appointment to pick them up in JULY! Of course our old Permessi expired in June making a gap. We visited the Large Lady who handles the health insurance with our receipts and the phone text with the appointment time. She was appalled at how long it had taken. She still couldn’t give us our new cards to last until the end of the year. So she just gave us until July 30. I was concerned that we have it in force for our upcoming trip to Poland. 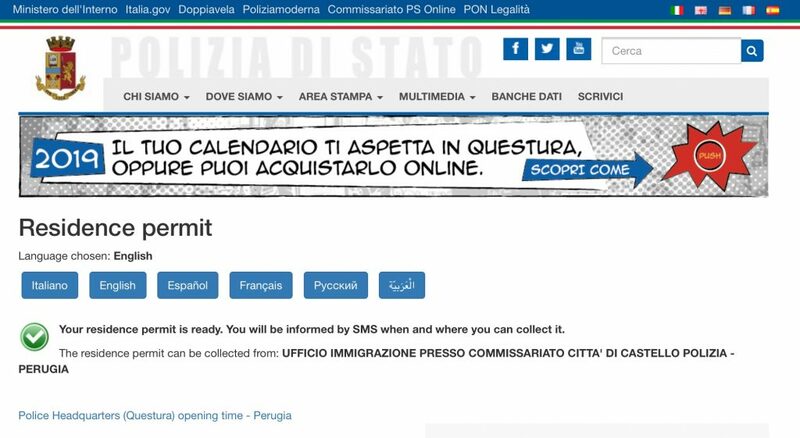 I have not reported on our efforts to get our Italian driving licenses. Since we have valid German ones we tried to have them transferred to Italian. Anything to avoid having to go to driving school and take the test in Italian! We have not been successful, alas. We were making good progress until the woman noticed that on the German license it gives our place of birth as our STATE and on our Italian documents our CITY where we were born was listed. Oh NO! So we brought our passports and our birth certificates to them which show BOTH city and state of our birth. They refused us. We will have to formulate a Plan B I guess. It is always something. So in just over a week we are off our our road trip to Poland, making stops in Slovenia, Slovakia, and Austria along the way. I hope it’s not too hot! We have found some Americans who wanted to come to Italy and offered to house/cat sit while we are gone. That is a nice thing for both them, us and the boyz. This entry was posted in Drivers License, everyday life in Umbria, Guests, Legal stuff, Uncategorized on July 2, 2016 by Nancy Hampton. Yesterday we went for our interview at the Questera to renew our Permessi. These police are in charge of immigration. They are based in Citta di Castello. They are generally very friendly. For this I am grateful because I’ve heard some are awful. After we got our fingerprints taken and had handed in all of our photocopies and passport sized pictures we thought we’d broach the subject of our Italian Culture class. More explanation about this is called for. We had to sign an agreement to stay in Italy. The letter we signed is an agreement between us and the “State, in the person of the Prefect of PERUGIA”. We agreed to attend this class and pass the A2 Italian proficiency test. There is a point system. The letter clearly states that we get 16 points up front. If we do not take the class we LOSE 15 points. We need a total of 30 points after two years. I should mention that they did not give us this agreement until AFTER our scheduled class date. We believe they forgot to give it to us when we went in for our initial fingerprinting etc. They told us not to worry at the time. Since then we have been trying to figure out how to take this class with no luck. The two year date for our agreement to expire is September 4 of this year and it says it gets reviewed and we’ll get a letter if we are not compliant and they extend the agreement one more year. Then if we still don’t pass muster they deport us. This week, when we asked the officer about how we can take the class, she said it is not mandatory and not to worry about it. I can’t understand why the Questura told us this when this paper is quite clear. I am sure we have not heard the last of this. Sigh. 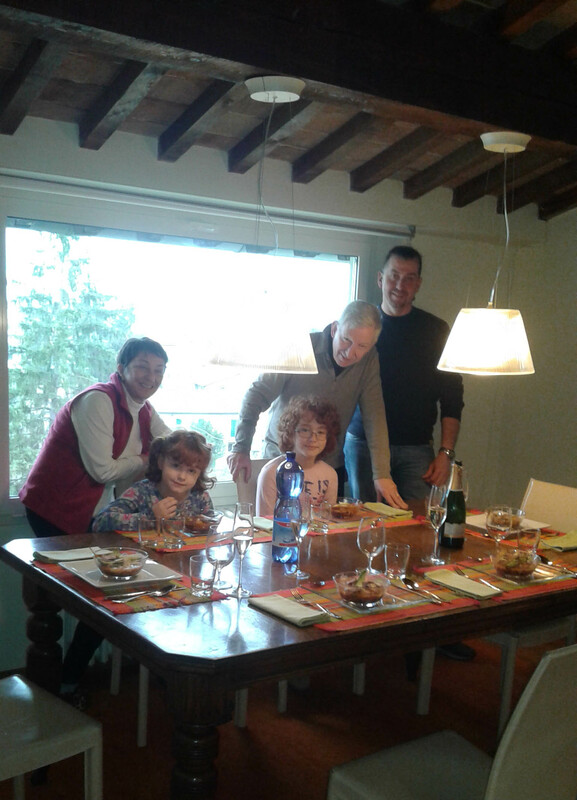 Last Sunday we decided to invite our friend Vera and her husband and two little girls over for pranzo (lunch). I made sure she was OK with something ethnic and she said she was. I made tortilla soup with added toppings of crisp corn tortillas, avocado, lime and cheese. Then we had a burrito with chicken with golden raisin sauce and sour cream. Next we had do-it-yourself tortillas. We had a tequila pork sausage with additional condiments of avocado, grilled onions, dressed cilantro, limes, tomatoes, with a mole sauce on flour tortillas. Everyone seemed happy to make their own. Graziano, Vera’s husband, was very adventurous for an Italian. Maja and Desiree who are 6 and 10 ate everything with gusto! And of course Vera, coming from Bosnia and Slovenia was excited to try all the new tastes. She also brought me the biggest chicken I’ve ever seen! And a bottle of Vin Santo as gifts. I should say it was all Italian spoken and I was ok with that. We had a lot of fun. Here we are at the table. Vera was taking the picture. 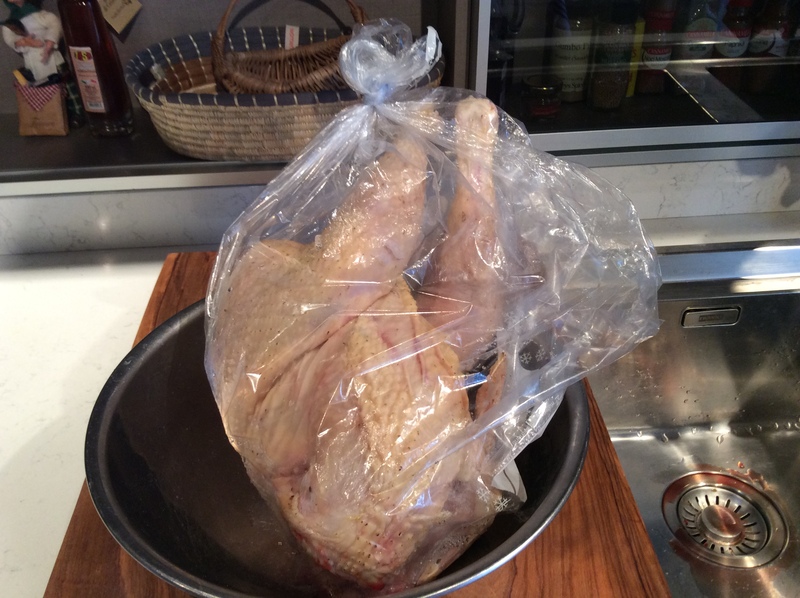 The chicken… Maybe tomorrow’s dinner? This week our weather has been very changeable. Lots of storms, blustery winds, sleet and rain. One morning we even had a rainbow across the valley. Today is the Saturday market. We have noticed that both the Wednesday and Saturday markets were very small this week. The big Wednesday one had probably a third of the normal vendors. I had mentioned in a previous post that I wanted to try the gobbi. I have a recipe which sounds pretty good and good for you. Here is the product I bought this morning. You have to trim the crap out of it. 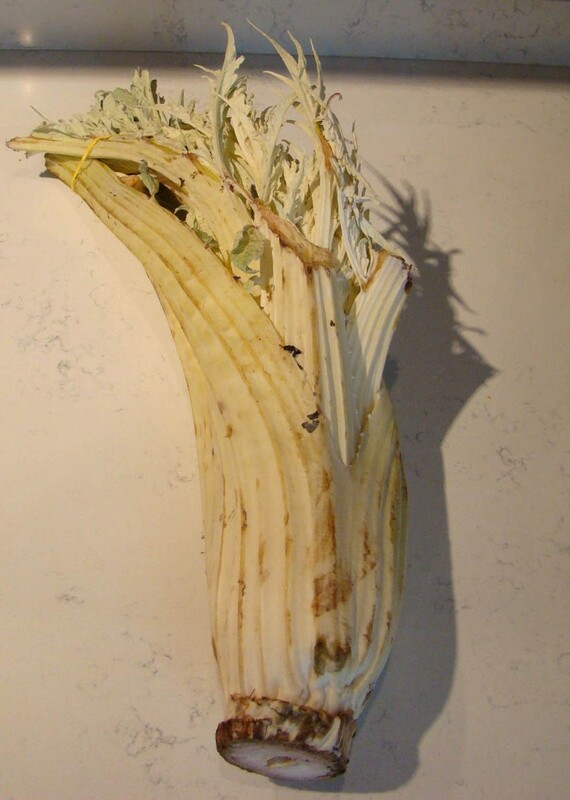 It is a relative of the artichoke family and has some spines that need trimming. I also removed most of the outer leaves. 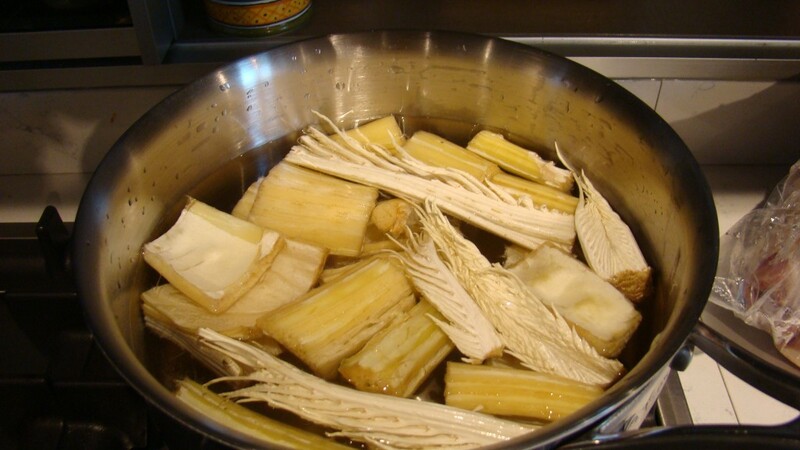 Like celery it has coarse threads that need to be removed. Once trimmed and chopped it looks like this. Now I need to blanch it until fork tender. The recipe says this removes the bitterness. If you like it bitter boil it less. Once cooked you sautéed some cherry tomatoes in olive oil and add some garlic. Put the gobbo in the pot and sauté until done. Here is a picture of the finished product. The taste was…forgettable. Not worth the trouble. 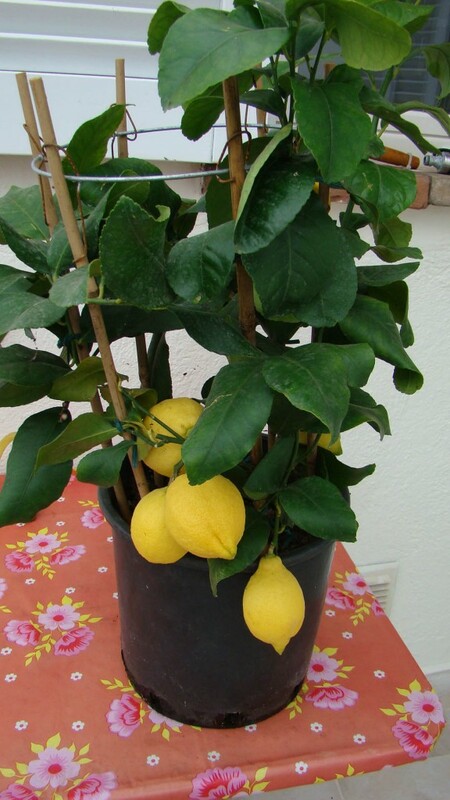 Finally I bought something I’ve always wanted to have…a lemon tree! Apparently they do well here and can be left out except for a hard freeze which doesn’t happen often. It will flourish in the sun on the terrace. And it flowers and fruits all year. See how pretty! 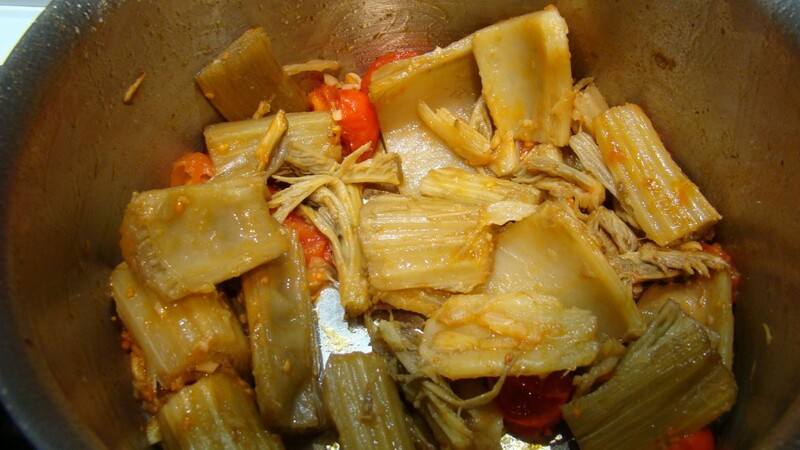 This entry was posted in cooking, Eating, everyday life in Umbria, italian paperwork, Legal stuff, Permesso di Soggiorno, Uncategorized on February 14, 2016 by Nancy Hampton.